Most homes and business are fitted with carpets. Dirt and grime accumulates over time on carpets and foot traffic is hard to clean with basic cleaning tools. 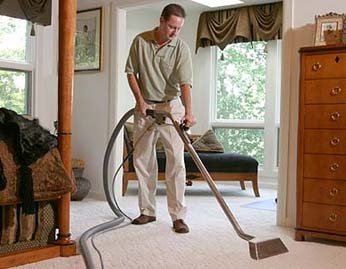 Therefore, there is a big demand for carpet cleaning services all over North America. And a carpet cleaning business that uses the right marketing mix along with great service has a good chance of becoming a lucrative business. Perhaps one of the best advantages that the carpet cleaning business has over other small businesses is the relative low cost on entry. A person can start a carpet cleaning business with as little as $1000 and add equipment as the business grows. Or one could choose a franchise operation where training and cleaning systems are provided but at a higher costs. The following are steps to considered when starting a carpet cleaning business. One needs to decide on the type of carpet cleaning services to be provided. Will it be a traditional carpet cleaning with a steamer? truck mounted service? or chemical cleaning? Who are the target customers, residential, commercial, or both? Commercial customers usually require a truck mounted machine, therefore it requires a bigger investment. Buy the appropriate equipment and chemicals to start. Develop a marketing campaign to get new business. One could opt for internet ads, flyers, and even radio. Decide on the rates for services. Some businesses charge a flat fee per room, others charge depending on the conditions of a particular job. Learning how to do the job before hiring. Carpet cleaning is not hard but one should know how to appropriately clean carpets and upholstery in order to train others. Accept credit cards and checks, give customer the convenience of payment. The carpet cleaning businesses is built on customer satisfaction. Make sure your customers are happy and business will be good.